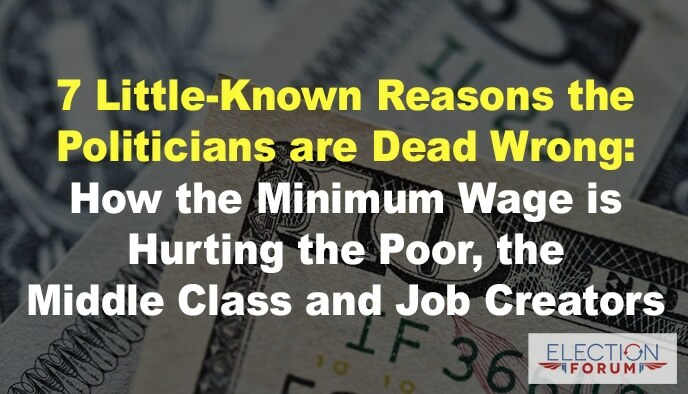 But there are 7 little-known reasons they are dead wrong. Raising the minimum wage is the worst possible thing you can do for the poor … and for everyone. As a business owner and a student of economics, I can tell you that most people don’t see the unintended consequences. When wages are increased arbitrarily … without a corresponding increase in productivity … or increase in the value of the service performed … some employees will be let go for being too expensive to keep on the payroll. A raise in the minimum wage never creates jobs … it always reduces employment. The ones hurt the most are those starting out – without job skills or specific job training and education. Wage increases are reduced or eliminated. In a free market economy, wage increases are based on increased productivity, increased skills or knowledge … or some other increase in value to one’s employer. Minimum-wage employees will be considered by their employers to be overpaid. A raise in the minimum wage reduces pay increases. Increasing labor cost results in higher prices. If a company wants to remain in business, it must continue to earn a reasonable profit even when the cost of overhead increases. If a company chooses not to lay off workers – or because of the work performed cannot lay off workers – it has no choice other than to raise prices. That’s why you see so many businesses raising prices today. Automation becomes cheaper than paying workers. McDonalds and other restaurants – as well as retail outlets – are experimenting with automated ordering and payment systems. Grocery stores and other retail businesses already have automated self-pay checkout systems. With the minimum wage ratcheting higher in steady increments, it’s only a matter of time until all human cashiers are eliminated from the retail sector. A minimum wage hike increases the acceleration of automation – causing more jobs to be lost. Kills on-the-job training programs and start-up jobs. History shows that restraining the growth of entitlement spending requires presidential leadership. The budget he submitted last year proposed to shave only 1% from entitlement spending that’s growing by 6% every year. Social Security and Medicare spending – the 2 largest entitlement programs – will exceed payroll taxes and premium payments this year by $420 billion. Kills job opportunities for marginal workers. Marginal workers are people who – because of either physical or mental challenges … or a combination of both – have limited job skills … and lower productivity than those with no limitations. These workers have more opportunities and a much higher chance of being offered a job in a low-minimum-wage job market. When the minimum wage is forced higher by law, companies can no longer justify the expense of hiring marginal workers. All of the unintended consequences of a high minimum wage combine together to produce a stagnant economy with fewer opportunities for cross-training and for job transfers. Fewer opportunities for cross-training and for job transfers mean less upward mobility. Employees are much more likely to become “locked in” to their initial job – and remain in it – for fear of not being able to find a new job were they to move … or were they to seek to capitalize on their work experience by quitting their current job and looking for a higher-paying job with another company. The government needs to stay out of setting wages! Yesterday, as I was checking out at a local market, the young store clerk lament that his hours have been cut and his income has gone down since the minimum wage increase. The elder board of my church was recently briefed by a member of the salary review committee on the anticipated financial impact of the first phase of California’s minimum wage hike for the upcoming fiscal year. The increase will be a bit more than $20K. This is a significant amount of money for our church. This escalation will continue in phases until the new minimum of $15/hr. is reached in, I believe, the year 2022. Now get this one. We were also informed that the teachers at our church’s K-8 school will have mandatory salary increases to achieve some level of parity with government school teachers of equivalent qualifications and job description. Sacramento socks it to us again. I’m wondering if it is common for a state government to institute wage controls for specific professions, aside from a general minimum wage. I’ve not heard of this in my lifetime. Whatever happened to the free market for labor? You are completely correct about the consequences. But, I don’t think that they are unintended at all. Consider that politicians hope that these negative consequences do occur, because jobless and poor people depend more on government, and on politicians, and are less independent. The above article on two studies of the effect of Seattle’s minimum wage discusses some of the effects related in the minimum wage blog.